The speaker turned the electrical current into a sound, and was the way for us to tell whether or not we had a short circuit. When connected to power, if the switch was pressed but the speaker made no sound, we knew we had short circuited. This happened many times. The switch controlled the flow of the current, and was the interactive element to the circuit. It was included in order to switch the speaker on and off. The capacitor stored and released the electricity. This was a necessary component for controlling the flow of current and ensuring that energy is given to the circuit when necessary. The one we used was non-polarized, so the current could flow through in any direction. 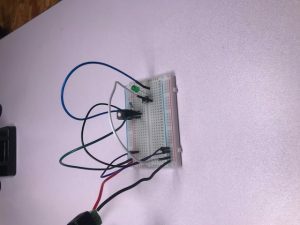 The voltage regulator made sure that certain paths in the circuit stayed within a specific voltage range. This was important so that the other components that the voltage regulator connected to would have the appropriate amount of power flowing through them. The wires connected the various electrical components to each other. Without them, well, it would be quite difficult to connect the components together. The power/ground source gave the circuit electrical current. Last week, we have learned how to use wire, vibration sensor, and speaker to amplify the sound. 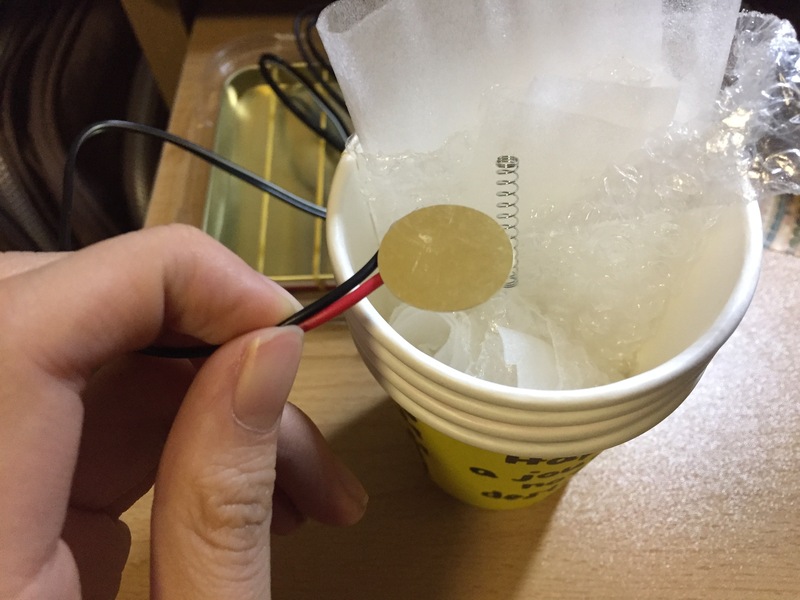 After we soldering the wires to connect to the vibration sensor, we could successfully plug it into the speaker and amplify the tiny vibration that we created. It’s really dramatic after we use this tool to actually hit or touch different object. The first question comes to my mind, what will happen if it touches different object? I have tried several varied materials to listen to the difference such as metal, plastics, paper, nylon, cotton etc. However, although they are slightly different, I cannot precisely catch up the different vibration when we used the sensor to touch it or hit it. Then, I have changed my angle to create my musical instrument, I came up with the new idea starting from the word “vibration”. What kind of material can be vibrated when we hit or touch it? How can I make realize the musical scale by using this material? I finally choose the “rubber band” which could be easily vibrated and can also create “do re mi fa” as a musical instrument. In this attached picture, I have tied five rubber bands on the lid of the mental box to create different sounds. 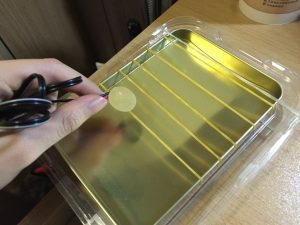 After I tried this mental lids, I also tied the five rubber bands on the plastic lid, which could create another kind of sound. Difficulty: it’s really hard to control the accuracy of the sound and I need to change the position of the rubber band all the time. Afte several comparisons, the mental lip could present the best quality of the sound. In his essay, “The Work of Art In The Age of Mechanical Reproduction”, Walter Benjamin discusses a shift in perception and its effects in the wake of the advent of film and photography in the twentieth century. 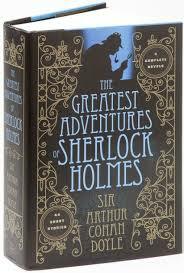 He writes how the sense changes within humanity’s entire mode of existence; the way we look and see the visual work of art is different now and its consequences remain to be determined. How are human sense perception related to history? Is it a universal perspective that is being critiqued here? Can there be a universal perspective in the first place? Benjamin here attempts to mark something specific about the modern age, the effects of modernity on the work of art in particular. Film and photography point to this movement: Benjamin writes of the loss of the aura through the mechanical reproduction of art itself. The aura for Benjamin represents the originality and authenticity of a work of art has not been reproduced. A painting behaves as an aura while a photograph does not; the photograph is actually an image of an image while the painting remains utterly original. The sense of the aura is lost on film and the reproducible image itself demonstrates a historical shift that we have to take account of even if when we don’t necessarily notice it. What does it mean when the aura is lost? How does it function and how does it come about? Benjamin writes the loss of the aura as a loss of a singular authority within the work of art itself. But what comes through in this new space left by the death to the aura? How does the mechanically reproduced work of art manage to make up for this void? As Benjamin continues, a tension between new modes of perception and the aura arise. The removal of authority within the original work of art infers a loss of authority, however, in regards to mass consumption, this liberation is not necessarily contingent. The cameraman, for example, intervenes with what we see in a way which a painting can never do. It directs the eye towards a specific place and a specific story; at the same time it is radical and revolutionary–it is also totalitarian. It guides us to a particular side of a story and leaves other parts out. It dulls our perception towards the work of art and introduces distraction as a mode of reception. The location of anything we might call the aura has to be moved into a mythological space; into the cult of genius. This cult of genius relates back to the cultish characteristic of the aura itself. What does it mean to place an aura on “someone” or “something”? Is it even necessary to reclaim the aura in the first place? The mystical cult of the original is broken with the loss of the aura, and now everyone can go to a gallery, a museum, the theater or the cinema. A whole new appreciation of art is introduced while at the same time, a whole new mode of deception and distraction also enters. For Benjamin, the aura is dead and it exists in an improbable and mystical space. But in the making of our own myths therein lies an aesthetic interpretation of these reproducible images; there is a temporal world that is there for you, where you do not truly participate. The object consumes man at the same time man consumes it. Mass consumption revels in this consequence of the loss of the aura. For Benjamin, a distance from the aura is a good thing. The loss of the aura has the potential to open up the politicization of art, whether or not that opening is detrimental or beneficial is yet to be determined. However, it allows for us to raise political questions in regards to the reproducible image which can be used in one way or another. The process of building the circuit. To be honest, these circuit are out of my knowledge because of the grounding part. I was confuse about the use of Voltage Regulator because i have never saw it before and i don’s know why this voltage regulator has a part to ground. 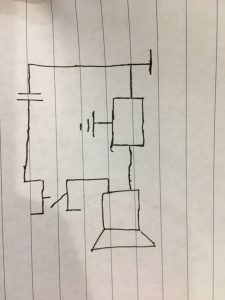 Therefore, it’s hard for me to connect this circuit because i don’t know how can work in that circuit the only thing i can do is followed the circuit diagram to connect all the components showed on the diagram with the wires. The process can be hard for me while i don’t know how to ground the capacitor with the voltage regulator and ground the whole circuit to the negative pole at the same time even i don’t know why we should do like that. We failed several times and with the instructor’s help we done it (circuit 1). Because of the limited time, we can only replaced the speaker with the resistor and LED. (as we do in the same way when we connected the third circuit). 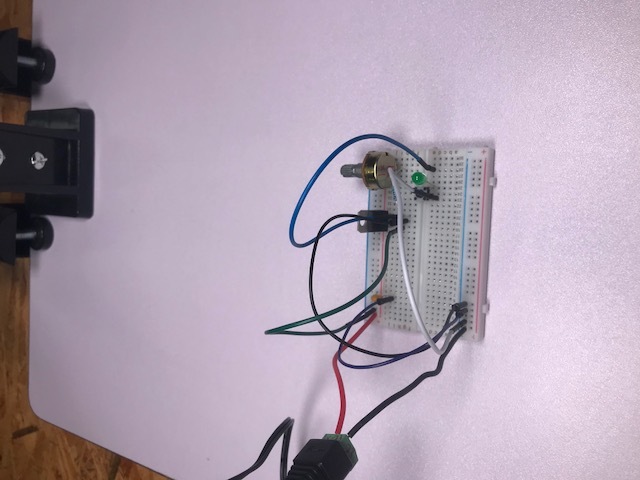 The outcome is the speaker can make sound when we turn on the switch in the first circuit, the LED gives out light in the second circuit and when we change resistance the LED’s brightness change in the third circuit. 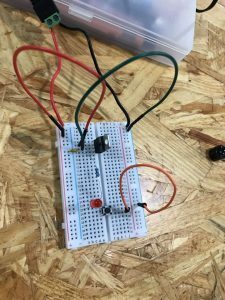 In the first circuit, you only need to press and hold the Push-Button Switch to close the circuit and the speaker make sound. In the second circuit, you also need to press and hold the Push-Button Switch to close the circuit then the LED light up. 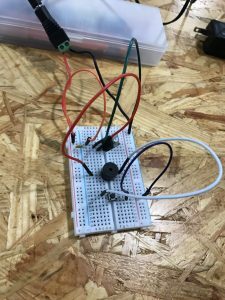 In the third circuit, there is a difference between the other two, you need to press and hold the button while you twist the variable resistor at the same time to change the brightness of the LED. R1. we are not familiar with the internal structure of the breadboard. 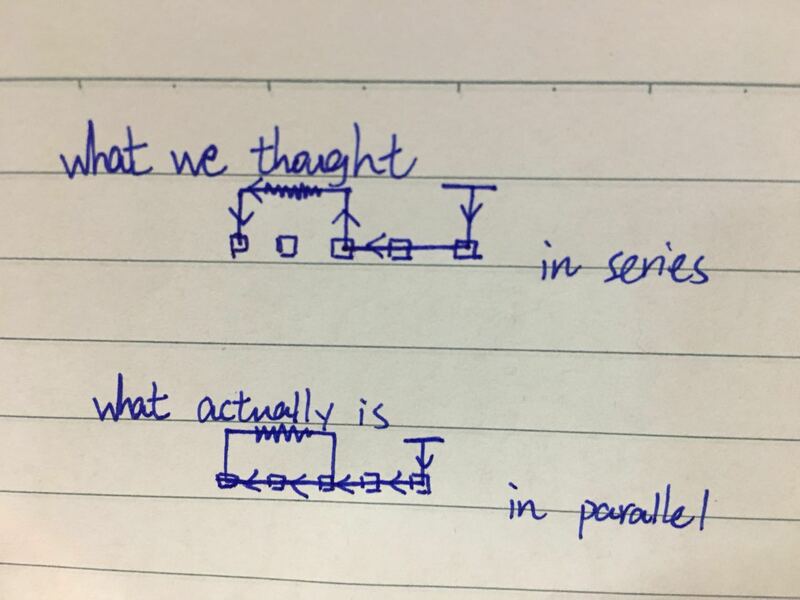 We forgot that all the five holes in a line are connected with each other with a same wire. Through that we, we inserted the voltage regulator horizontally rather than vertically. R2. The “typesetting layout”( i don’t know which word to use) of the circuit is not clear enough. We connect all the components in a very hour distance and the whole circuit looks like a mess. When we check it’s correct or not the messy circuit can mislead us sometimes. However, when the instructor gives us a demonstration the circuit is symmetrical and clear to see. Q1. 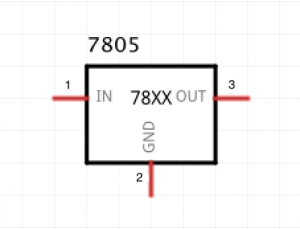 Why why this voltage regulator has a part to ground? Q2. 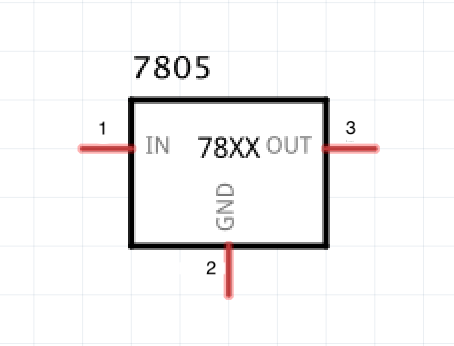 How to ground the capacitor with the voltage regulator and ground the whole circuit to the negative pole at the same time and WHY? Question1. Do you think that the circuits you built today include interactivity? No. I don’t think what we did today can be a interactivity. 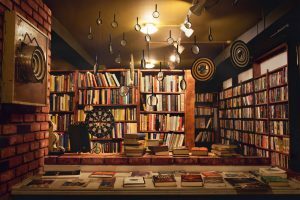 Like in the reading the author mentions that the interactivity is not simply make a connection between the different components. Interactivity is a process to interact with the components, even you make the speaker make sound but the sound means nothing and that just like you hit the board to make sound. You have to get the responses from the “thing” you have designed or created. Question 2 Identify which components used today were sensors, and which components were actuators. Question 3 How can Interaction Design and Physical Computing be used to create Interactive Art? How can interaction design and physical computing be used to create interactive art depends on how do you understand PEOPLE and INTERACTIVE. For me, “people” can be their emotion inside and the five senses which truly interactive with the other thing. Let the physical computing to understand human beings’ emotions and relationship to the digital word. Besides, the interaction art is the interaction between the human beings and the virtual world in art. -Try to document the work. -Reflect on this week’s readings and answer several questions. Breadboard – Holds and connects every component of the circuit conveniently and effectively. 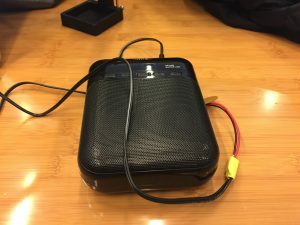 12 volt Power Supply – Converts the 220v output into 12v. 100 nF (0.1uF) Capacitor – Used to charge and voltage regulation. Push-Button Switch – Mechanical button which is used to manipulate the circuit by determining the electricity going through to flow or not. 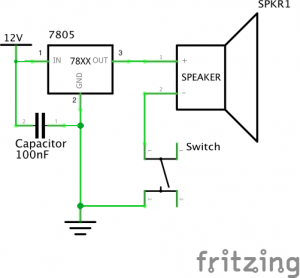 Buzzer – Works as a speaker and can make a beep sound when the circuit functions. Needs 5v. Barrel Jack Jumper Cables (Hook-up Wires) – Connects each component of the circuit to make sure electricity can flow properly. I admit that we have met a lot of problems for this first circuit and they literally popped up everywhere, making this exercise really a big challenge to our group in the beginning. 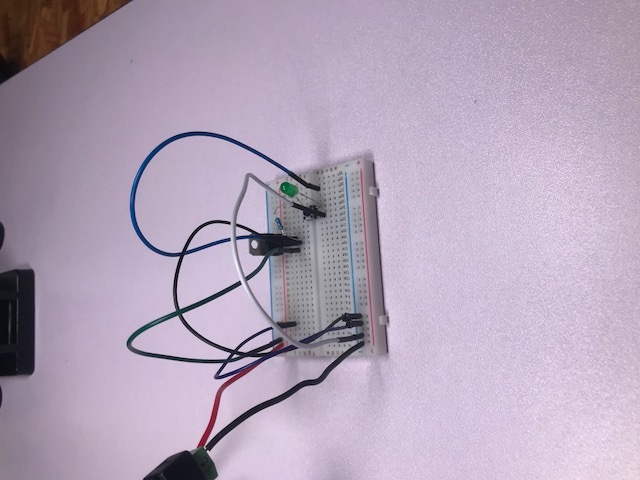 We first began with reading the schematic and realized that it was basically a series circuit, so we thought it was nothing difficult and began connecting components to the breadboard without carefully reading the guidance for them. 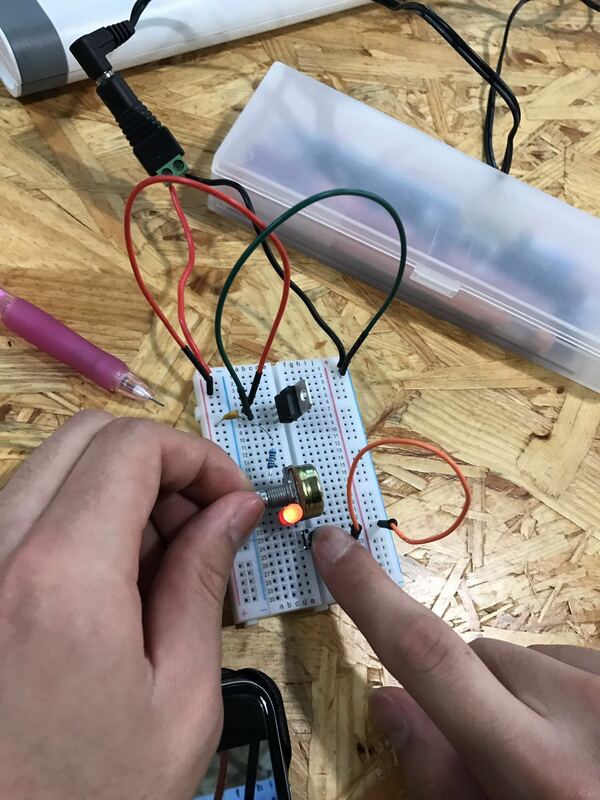 It was the first mistake we made and because of it, our “first draft” failed on account of our wrong way to connect the voltage regulator to the circuit. Thanks to one of the fellow’s “debugging”, we found out that we had connected 2 to the output and 3 to the ground, which was definitely a big mistake and made us become aware of the significance of reading necessary instructions for unfamiliar components before putting them into circuit. Also, what I learnt from this exercise was the ability to “debug“. Given that I have taken communication lab before, this word is not a stranger to me because when writing codes, debugging is both a necessary step and a vital skill. 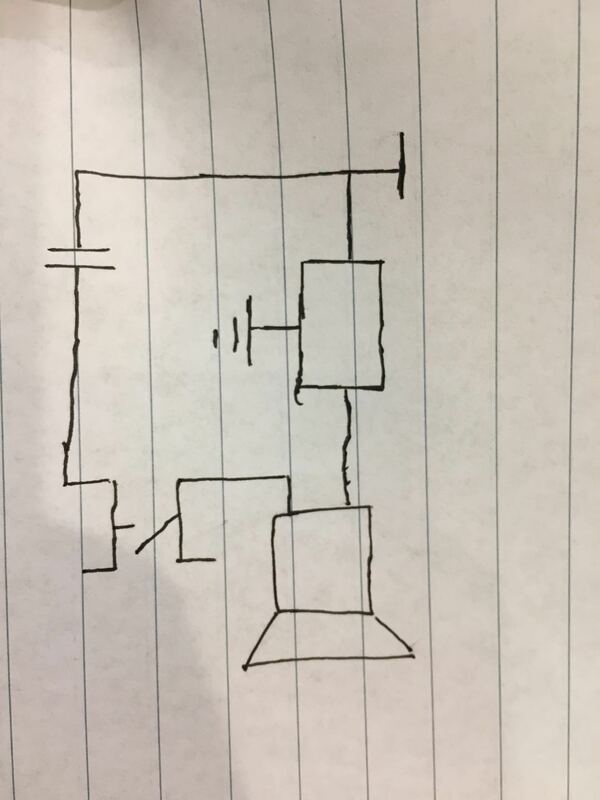 However, I now understand that it is also an important step for making circuits and we have to do it carefully and patiently when we find the circuit doesn’t work as we expected. 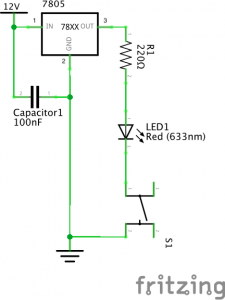 220 ohm Resistor – Lowers the 5v output from the voltage regulator into 3v in order for the LED to work properly. 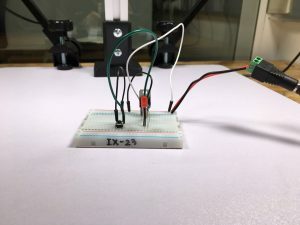 LED – Light diode that accepts 3v. Due to the experiences and lessons we got in the first exercise, this circuit two became much more easier. Based on the first circuit, we only replaced the buzz with a LED and added a resistor to it so that the LED would’t bomb up or even die 😂. As the old saying goes, practice makes perfect. With the experiences we got from the first circuit, I was doing much more better this time and I also developed a new skill this time– taking high digital, beautiful, wonderful, fantastic, marvelous pictures of my cute circuits! 10K ohm Variable Resistor (Potentiometer) – A knob to control the amount of voltage sent to the LED in order to control its brightness. 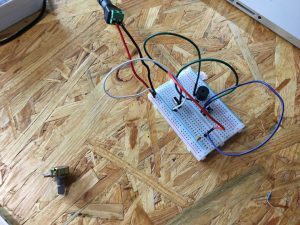 This circuit is also based on the previous examples but this time comes a new friend–variable resistor. As a new component, it also has its unique way of being connected so we again, met some trouble this time. After reading the instructions, again, we quickly completed this circuit. 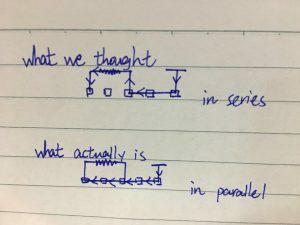 But I still had some doubt about the distinctions among three different connecting points of the resistor. So out of curiosity, I asked a fellow and he told me that the middle one must be connected to LED or else, its resistance won’t change and consequently, the brightness of the LED also won’t change. Either side is OK for the LED but not the middle one. I think it is kind of interesting to figure out all the curiosity instead of leaving them there and I am really grateful to all the helpful fellows! 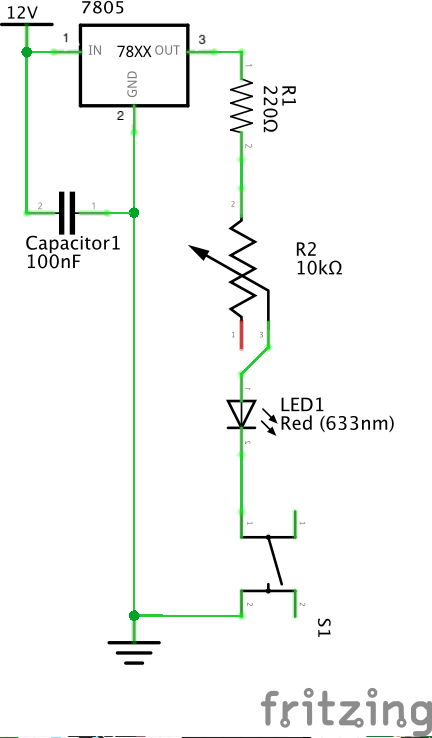 Rotate the variable resistor and the brightness of the LED will consistently change. Isn’t it amazing? Make friends with new components is always a lot of fun and it is also meaningful to understand how they work! YES. I think the circuits we built are no doubt interactive. According to the reading, the definition of interaction is “a cyclic process in which two actors alternatively listen, think, and speak”. So under this circumstance, the user is an actor who is relatively active and the circuit is the other actor. In the first two circuits, user can command the circuit by pressing the button to let the buzz or LED work or not, while in the last circuit, user can even control the brightness of the LED by rotating the potentiometer. So it is evident that one actor can accordingly respond to the other, and it can be even considered to be a mutual process because the circuit can also influence the user’s response. As an open-source platform, Arduino is meant to simplify the process of developing electronic devices. 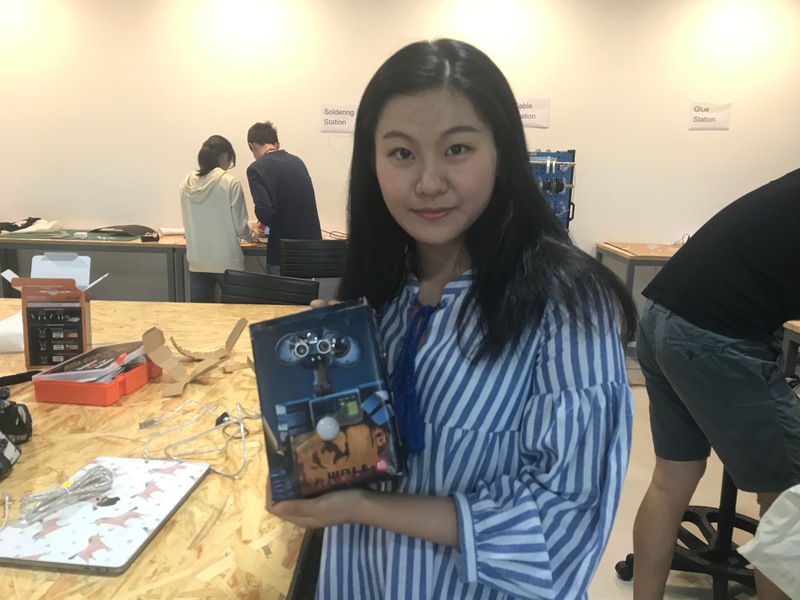 It makes it possible for people without knowledge of electricity also able to create their own interactive electronic devices. Various communities are also gradually formed and people can share their creations with others who are also interested in them or are in need for them. Different ideas can clash together and inspire each other, which often gives birth to some fantastic new creations and this is no doubt good for the development of interactive arts. Also, Arduino provides a interface friendly to programming and allow producer to both easily and precisely control the sensors and actuators. As a result, sensors and actuators can work perfectly with the user according to the codes. What’s more, the examples given by the speaker are also convincing evidence for the argument that Arduino is good for interactive arts. Then we made the other two circuits based on what’s shown in the schematic diagrams. I found that the schematic diagram given was somehow not so intuitive; maybe more practice can improve it. No, I don’t think the three circuits include interactivity since there lack the process of precessing. Turning on or off the devices is merely physical work (open or close the circuit) and , at least according to my subjective definition, cannot be considered as “processing” as there is no presence of electric signal throughout. I still don’t have a clear idea of interactive art so far, so I guess I will save this question for later and would gather my thoughts as the class proceeds. When my partner and I first tried to build the circuit we did not succeed. 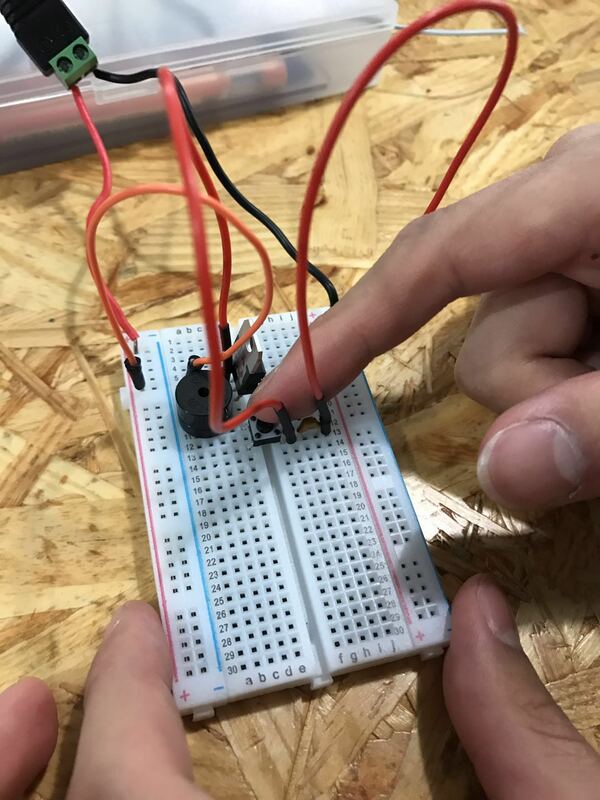 [insert picture] We did not connect the components correctly and neither of us understood how to determine where the ground would be located on the breadboard. After troubleshooting with Marcela, we figured out where the ground was and reconfigured our circuit. Once we figured out how to connect all of the components correctly, we were able to get the speaker to work. This circuit is interactive in the sense that it can be manipulated by an individual. 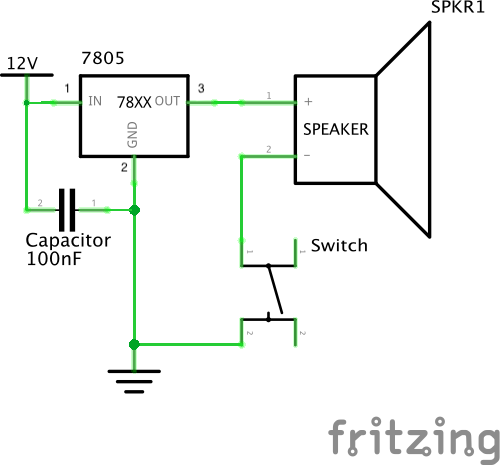 If the switch is pushed, then the speaker creates a beep. When the switch is released, the sound stops. Therefore, any individual can control when the speaker makes a noise. 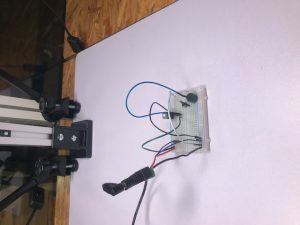 We did get the circuit to work at the end, but we struggled in the beginning with trying to figure out the best way to arrange the components and how to connect them to the ground. After switching things around and troubleshooting, the circuit worked. The most difficult part for me was understanding how everything was supposed to fit together on the circuit. Figuring out the correct connections of the voltage regulator was also a challenge. As the circuits 1 and 2 were similar in setup, my partner and I decided to remove the speaker while keeping the rest of the circuit intact. After this, we added the LED and the resistor into the circuit. Now that we had experience building the first circuit, we were able to build this one quickly and without help. 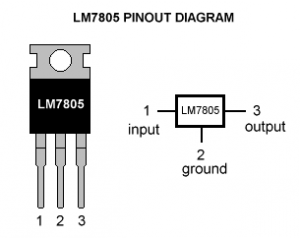 An individual can interact with this circuit by using the switch to turn the LED on or off. When the switch is pushed, the LED turns on, and when the switch is released, the LED turns off. This circuit worked as we had just swapped out a few components from circuit one for new ones in this circuit. Though we had to add in a resistor, it was relatively clear on how to configure it in with the rest of the circuit. We kept most of the previous circuit intact, but had to do a bit of reconfiguring in order to get the variable resistor to work. Like our struggle with the voltage regulator in circuit 1, I also had trouble with configuring the placement and connections with the variable resistor. However, after troubleshooting, we were able to get everything connected properly. 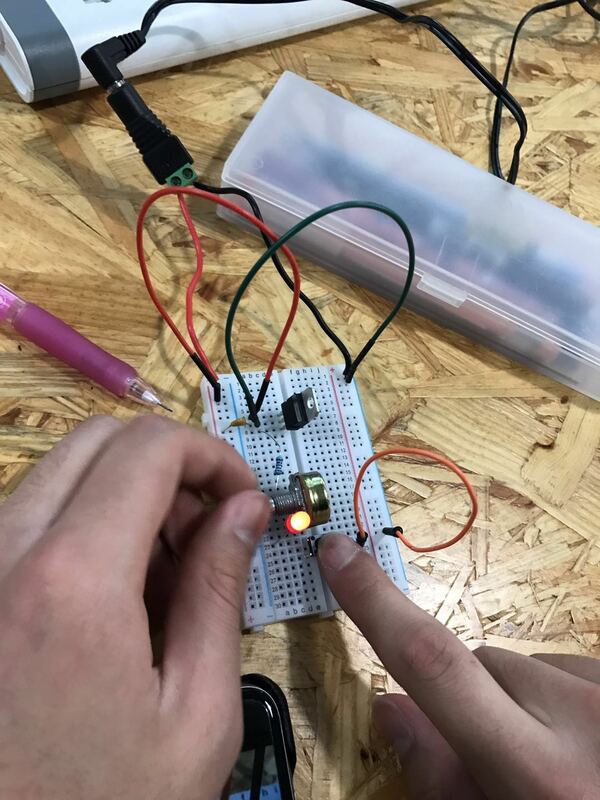 A person can use the switch to turn the LED on and off, but they can also use the variable resistor to control the brightness of the light. 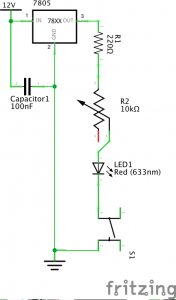 By making the resistance higher, the LED dims, lowering the resistance leads to a dimmer light. After troubleshooting the connections to the variable resistor, the circuit worked. With the variable resistor we were able to control the brightness of the LED. Considering the definition of interaction as “a cyclic process in which two actors alternatively listen, think, and speak” then these circuits can be considered as interactive (5). In this situation the actors are the individual (in this case me), and the electrical circuit. Using circuit 1 as an example, I make an action by pushing the button on the switch, the circuit “listens” to this action, then “speaks” by signaling the speaker to make a beep. Though this circuit demonstrates a low level of interactivity, it is still interactive as one of the actors still has to listen and respond to the other, thus following this definition of interactivity. 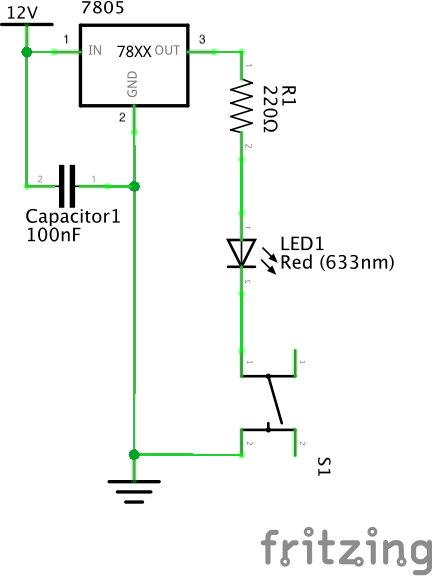 The components which can be considered actuators in these circuits were the speaker and the LED. These components are sensors as they convert electrical energy into other forms of energy, such as sound and light. The components which can be considered sensors in these circuits were the switches. 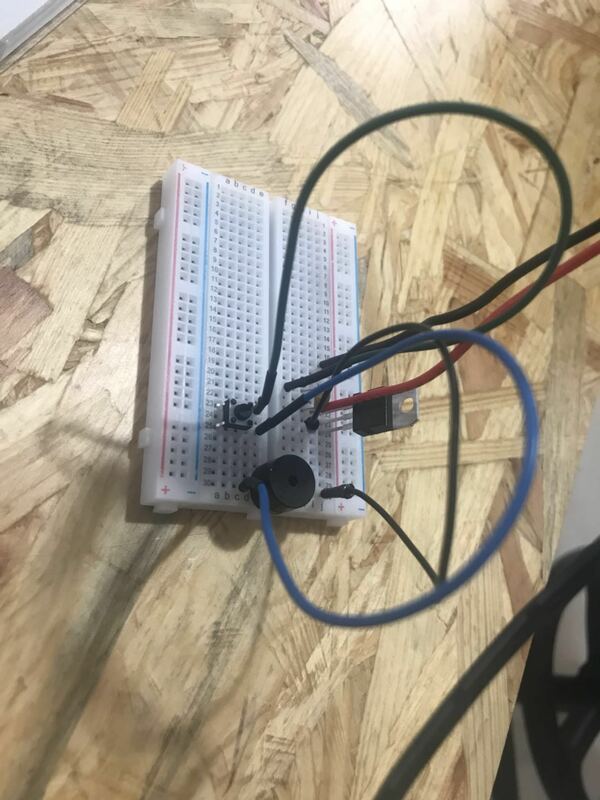 The switch is a sensor as it converted energy (like the push of a button) into an electrical signal which would then prompt the speaker to make a beep or the LED to emit light. In term of interactive art, I would say that interaction design is similar to the blueprint of what one wishes to accomplish, and physical computing is the way in which this is accomplished. While some interactive art can exist solely on the internet (and not be touched physically), plenty of interactive art relies on some sort of physical computing to bring the system to life. For this assignment, I played the Sims 3, a game that never failed to get me hooked, and momentarily forget the worries of the real world. The last time I played the game was a few years ago, so it was definitely refreshing getting back into it. I continued the game from where I had left off – I was running the “Rick family”, which consisted of 4 members: a father, mother, son, and daughter. The father is a surgeon, the mother a Vice President of a business firm, and both children go to school. The son is a delinquent who doesn’t really study and stays on the verge of getting kicked out of school. Conversely, the daughter is a stellar student who is on her way to attend a private school, followed by a prestigious university. Yes I know, sounds like a stereotypical dysfunctional family. But wait, it gets better! Both adults in the family had lovers who until my last play, had not been exposed. However, this time when I played, I felt like stirring up some chaos in the game, and hence, exposed both secret lovers. What happened next? Well, the couple had a long period where they would argue every time they saw each other, and later on went to the extent of getting into physical fights. However, I felt bad after a while and then tried to patch things up between them – of course, the lovers had to go. During all this time of gameplay, I was completely immersed into the game, and felt as if I was a big part of it. I feel what makes the Sims so immersive is being given the ability to control so much. As a player, you are the master or ‘God’ of the Sim world, and have almost full control over their lives. A Sim, is like a virtual human being. Hence, since a lot of what happens in the Sims is relatable to the real world, it helps give one a sense of attachment to its virtual world. In short, you create and live your own story/fantasy. This overlap and balance between the virtual and the real helps make the game fun, immersive, and addictive to play. Additionally, the “dehumanization” factor, for instance with the Sims having their own language (gibberish), adds a fascination of its own. This “dehumanization” allows for one to do the most bizarre things without feeling bad. Hence, the game provides a ‘safe-space’ of immersion where people can do and feel whatever they want, with no judgement from the outside world. You can go on a killing spree and annihilate the whole Sim neighbourhood, yet not get into trouble for it. Furthermore, the level of customization is simply incredible, and it is a big immersion factor for many users. It helps in living out the fantasy – whatever it may be. Another helping aspect is the amount of mods available for the game which also help make it closer to one’s expectation of their ‘ideal’ virtual world or fantasy. For instance, there is a Harry Potter mod that adds magic, castles, and numerous other items from the Harry Potter world into the game. For a Harry Potter fan, the mod could drastically help turn their Harry Potter fantasy, into a virtual reality. The possibilities are endless. In short, I think the Sims franchise does a splendid job with providing a very immersive experience to its players. Post on the blog your reflections about the readings, what is play for you? Mention your favorite toy(s) and describe the type of toy according to the play pyramid. Why do you like it? How do you play with it? What is the target user for this toy? is still in the market? My interpretation of the word: play is very loose, I usually only restrict its definition to the engagement of an activity with the intent of enjoyment. Similar to that of the quote: “Don’t play with your food” it is a sign of engaging with something that is not serious, unlike a meal in which we should appreciate and consume. If I were to choose a favorite out of my toys I believe I would have to say Runescape, an MMORPG found on the internet circa 2005. Under the categorization of PlayPyramid, it would be classified as a fantasy challenge game in which has passive involvement, associative social involvement, with an open level of restraint, mentally driven neutral gender. I enjoyed the game because I was able to fantasize being back in the medieval ages and explore a new world of possibilities. Although this era is very open with gender stereotypes, it tends to be a more male-driven targeted toy due to emphasizing on heroism and fighting. It is still on the market but has dropped popularity as video games on consoles have increased their production power. 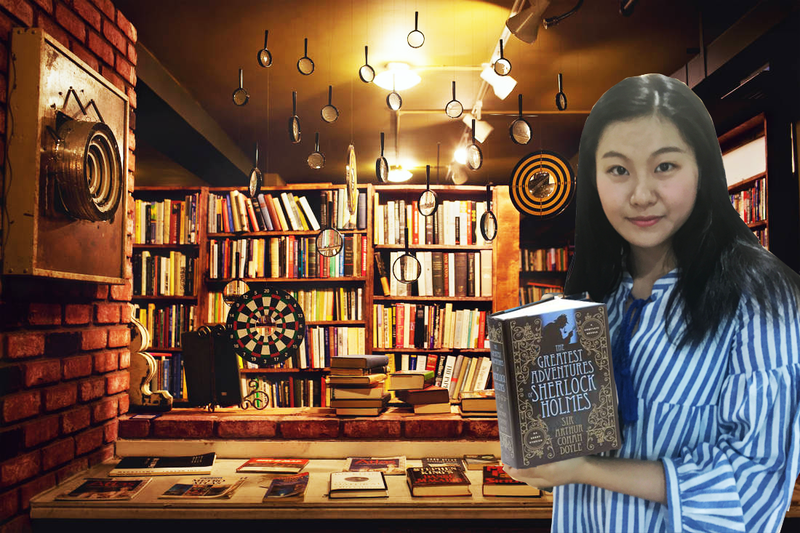 For this Photoshop assignment, I have created a composite image where I am recommending my favorite detective series Sherlock Holmes in a bookstore. This picture is composed of the following three images. It is great fun to manipulate an image and this manipulation is mainly realized with Lasso Tool in Photoshop.